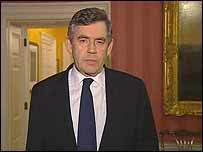 Seventy-two hours into his tenure, Gordon Brown doesn’t look so good. He just delivered a live terse statement to the television networks. His message was acceptably courageous but his appearance was less-than-inspiring. His hair was mussed. Exhaustion showed in his eyes. Even worse, the backdrop for this important statement was a hallway with doorways visible in the shot. Finally, he turned and walked away with the cameras still rolling. Awful. I can imagine Brown doing away with carefully orchestrated backdrop so as to distinguish himself from his illustrious predecessor Tony Blair. It’s also possible that being sensitive to the anti-national sensitivities of Brits these days, Brown was reluctant to be shot standing in front of the Union Jack. Having said that, the whole thing looked slap-dash and rinky-dink. It was the kindof set-up I would have been embarassed to arrange if were Brown’s communications director or press secretary. The first thing any chief executive has to control is how he or she gets the message out. And here Brown failed. Let’s see how Brown passes the substantive aspects of his first test as prime minister. I’m afraid that folks in Britain and the world are going to be missing Tony Blair quite a bit in the coming days.